B.S., Peking University, Beijing, 1991. M.S., Institute of Geophysics, Chinese Academy of Science, 1994. Ph.D., California Institute of Technology, 2002. Research focuses on exploring the physical processes of large earthquakes with various modern geophysical observations, such as broadband seismograms, high-rate GPS, and radar interferometry. 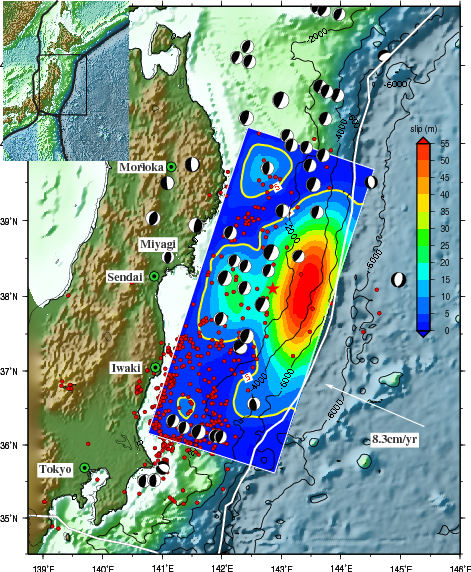 A maximum slip of almost 50 meters (165 feet) occurred on the fault accompanying the Japan earthquake.